For the Dutch Marc Leeuw the Dakar started not as expected. Only 500 meters after the start the DAF crew had to stop due to technical problems. The repair took more than two hours, so that the Truck had to cover the 31 kilometers through the already treacherous dunes in the dark. "Normally driving in the dunes is not my speciality - but driving through dunes in the dark is really terrible," said Leeuw in the finish. "Having a good overview is important in the dunes. You have to be able to see where you have to go and wisely choose your track. But you don´t see anything in the dark. You can at most follow a track and hope that it´s a good track." 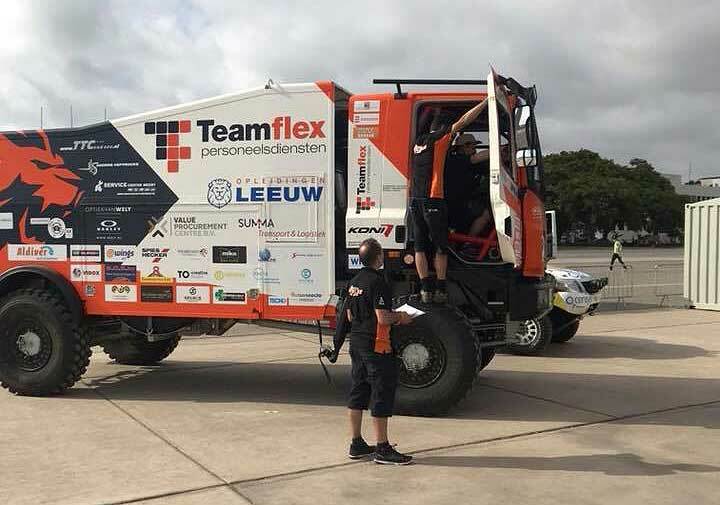 The misery started for Marc Leeuw right after the start: "Immediately afterthe first jump the truck just did not make any progress. We first thought it could be the tires, but it soon became clear that it was the link. We did not notice anything on the 250 kilometers connection." Leeuw got help from Mammoet Rallysport driver van Kasteren, who finished the stage and went back with his quad. Because of the dramatic opening stage, Leeuw will start in the second stage as the second last truck, but this is ok for the Dutchman. "Starting from behind gives a bit more time to get things right again. In 2012 I also had a bad first day and I learned that it is pointless to try to catch up on time. That only gives even bigger problems."